Gilead Sciences (NASDAQ: GILD) is a biopharmaceutical company. The company had given stellar returns to the investors when the Hepatitis C drug sales were growing. Once the generics entered the market the sales dropped and also the stock took a hit. However, earnings are expected to turn around in the next couple of years. So the stock is once again in the radar of value investors. The company announced recently that Daniel O’Day will be the new CEO of the company. He is the former CEO of Roche Pharmaceuticals. The company’s chairman of the board of directors John Martin also stepped down this year. Investors are hoping that the new management could drive the company in the right direction. During the last quarter’s results revenue came at $5.8 billion, which beat the median analyst estimates by $280 million. Total revenue for 2018 came at $22.13 billion when compared to $26.10 billion for 2017. Earnings per share for the 4Q 2018 came at $1.44. For the full year, 2018 earnings per share came at $6.67 compared to $8.84 for 2017. For the year 2019 analysts expect the EPS to come at $6.63. The company has approximately $31.5 billion in cash and cash equivalents. Debt at the end of December 2018 stands at $27.50 billion, down from $33.75 billion at the end of December 2017. The dividend yield is attractive at 3.74%. The company also repurchased shares worth of $962 million in the fourth quarter of 2018. Gilead is trying hard to lower the operating expenses. Recently, the company announced that it’s laying off 150 sales which account of 20% of the total sales team. Two of the company’s older drugs have lost patent protection, generics would enter the market. UBS analyst Carter Gould upgraded the stock from Neutral to buy recently and raised the price target from $75 to $77. 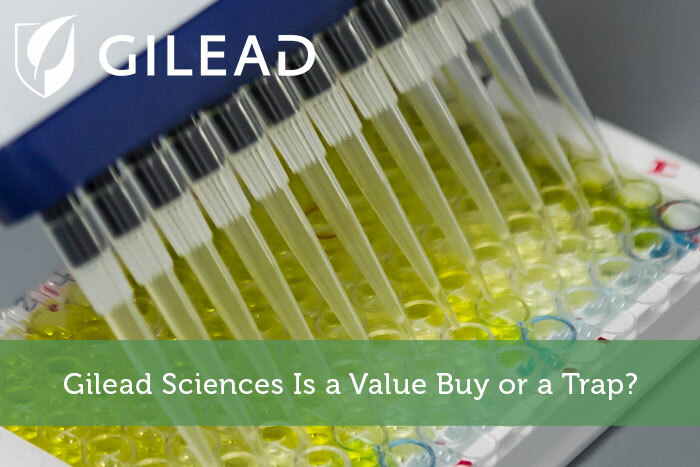 “Following the failure of selonsertib in NASH, Gilead has rattled off two important clinical wins: positive Descovy PrEP data and filgotinib FINCH1/3 data — unlocking two $2 billion-plus revenue opportunities and going far to derisk outer year (2021+) growth,” the analyst said. The company has a strong product portfolio and also a good pipeline. GS-6207 which is currently in Phase 1 clinical studies could be a blockbuster drug for the company. RBC analyst Brian Abrahams estimates that the net present value of GS-6207 is more than $20 billion. The appeal of GS-6207 is that it could become the backbone of long-acting combination HIV therapies. For the year 2019, the product revenue guidance is $21.3 billion to $21.8 billion compared to $21.0 billion for 2018. The company could also taste success in Oncology and not to mention there are other several promising therapies due to the acquisition of Kite Pharma in 2017. Conclusion: The Company is trading at an attractive forward P/E ratio of 9.72. However, the company has been trading at a lower valuation in the past couple of years. Investors need to take note that the company has a strong pipeline for the next few years and with the new management we could see some positive action in the second half of 2019.